Deep frying fish is a great way to cook fish to a tasty, beautiful golden brown, and perfect crispy crust. This deep fried method of cooking fish is the most common technique used to make fish-n-chips. We will be going over the varieties of oils you can use, how much oil to add to your cooking vessel, recommended oil temperatures, types of fish that work best, and a simple mini tutorial guide for preparing and frying your fish. This method involves cooking fish in a total submersion of fat. The fat is usually oils of canola, corn, cottonseed, peanut, pure olive, safflower, sunflower, or solid vegetable shortening. The choice of a good oil is up to you according to your taste. Peanut oil is very nice choice for deep frying fish. Other than a deep fryer, a deep pan or a wok can be used instead. 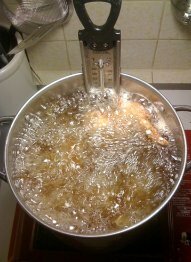 Fill up the cooking vessel to about 1/3 to 1/2 full of oil, but no more than 2/3 full so as to avoid boil-overs. Heat the cooking oil until it reaches the smoke point of 375°. It's important to maintain the cooking oil at the correct temperature. If the temp drops down below 350°, then the fish will begin to absorb the cooking oil and it will become greasy and soggy. If it rises above 375°, the fish will overcook on the outside without cooking the inside. A deep frying thermometer is a great way to help maintain and adjust the temperature of the oil. Pieces, strips, fillets, or whole fish that are less than 1½ inches thick are best to use when deep frying fish. The less bones that are present in a fish, the better it is for deep frying. The reason why is because deep frying is a quick method, which doesn't allow for enough time to break down the structure of the bones as slower cooking techniques are capable of doing. You can coat them in a breading or the batter of your choice. Dredging the fish in flour first can help the batter to stick. Gently add just a few pieces at a time to the hot oil. Be sure not to overcrowd it because the temperature of the oil will drop when food is added to it. Cook for a few minutes until they're done. They should be a nice golden brown on the outside, and moist and flaky on the inside. Drain for a few seconds in a fry basket, then place on paper towels to help soak up the excess oil. If you'll be frying more fish, place the cooked fish in a warm oven at around 175°. Be sure to allow for the cooking oil to heat back up before adding another batch of fish. Serve immediately with your favorite dipping sauce and sides. Enjoy!